In March 2016, we made a suggestion that making an investment in the Shanghai equity index had attractive probabilities and was an equally such proposition. 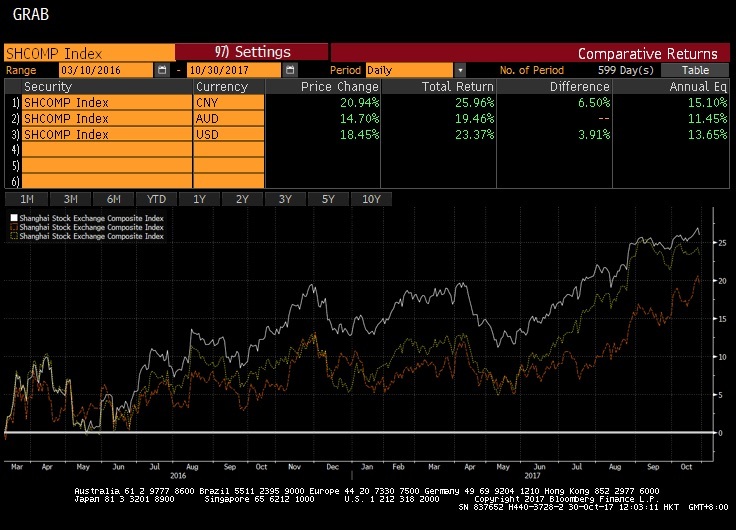 Since then, its total return has been between 19% – 25% (depending on the currency of measure) as displayed in the image below. This means an average of more than 1% per month for the past 18 months. We think this has been a more than adequate return when considering the amount of risk we were taking and when comparing it to other alternatives including investing in cash or fixed income. Furthermore, the Shanghai Composite Index was trading at an “oversold” levels which we hadn’t seen for many years. Interestingly, whilst many major equity markets power on to new all-time heights, the Shanghai Composite is still 50% below its peak of 10 years ago. I would like investors to ponder what the Chinese stock market will look like in 20 years time.